If you’re interested in talent acquisition analytics and why it matters, you’ve come to the right place. This blog post will explain what talent acquisition analytics is, how it can help your company make the right hiring decisions, and what you need to do in order to take full advantage of it. Finding and hiring the right talent has become the top priority for many businesses. This is not entirely surprising when you consider the negative repercussions one bad hire can have on a business. 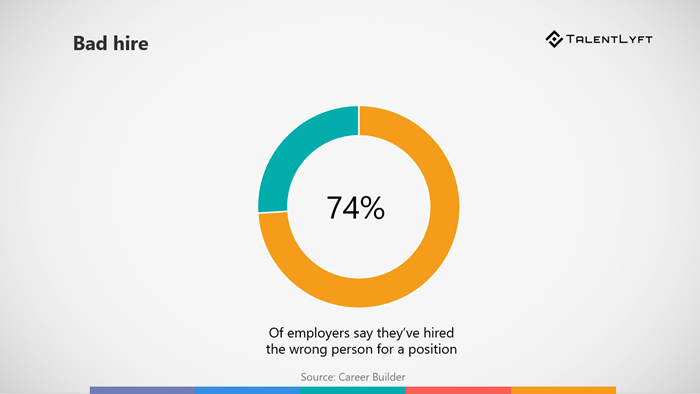 Nearly three in four employers say they have hired the wrong person for a position, and that their companies lose an average of $14,900 on every bad hire. How to avoid bad hire? So how can an HR professional make sure the candidates they are recruiting and hiring will be a good fit for the company? The short answer is: leveraging data. This post will go into further detail by explaining what talent acquisition analytics is, how it can help your company make the right hiring decisions, and what you need to do in order to take full advantage of it. 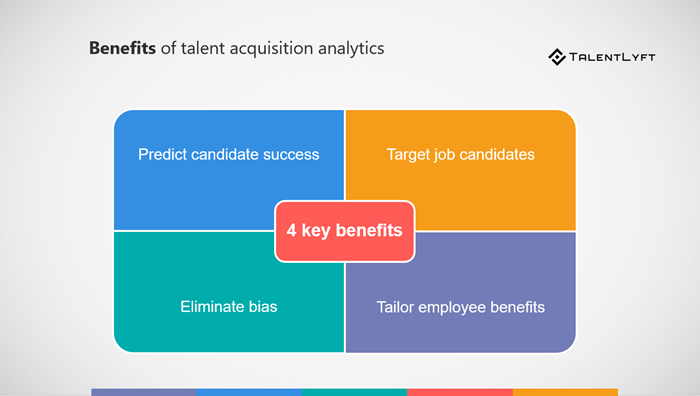 What is talent acquisition analytics? Unlike the regular hiring process, talent acquisition is a process that occurs when companies are looking to fill a skills gap in an organization. Instead of focusing on simply filling an open position, hiring professionals have the company’s strategic goals in mind. The stakes are higher, so there is a greater emphasis on developing tactical HR analytics and data-driven recruiting approach to acquiring the right talent. That’s where talent acquisition analytics comes in. In short, talent acquisition analytics can be defined as using data to inform hiring strategies and processes. According to LinkedIn’s Global Recruiting Trends 2018, 50% of hiring professionals use big data as part of their strategy, which has helped them with talent acquisition and increased their employee retention by 56%. HR departments are able to draw insight from their people and company data to better assess what makes an employee successful, how to identify the right candidates, and what makes your company appealing to potential future employees. Once identified, this information can be leveraged in recruitment to identify and fill talent and skill gaps. Organizations can use analytics to predict a job applicant’s future performance. Using people analytics, companies can pinpoint what a successful employee looks like and develop a candidate persona that matches. That way, they can look for similar characteristics, activities, hiring managers, education, and experience when making hiring decisions. Predictive HR analytics can help recruiters quickly identify the right types candidates, find them, and connect with them. Once you’ve targeted the specific skills and characteristics you are looking for in a candidate, you can use data to figure out where that group is (some social media sites can help you pinpoint this) and post your job ads where they will see them. You can even craft the language in the ad/job description to suit the personality of the candidates you are trying to attract. Data doesn’t care about the age, gender, or race of an applicant. People, on the other hand, are flawed. Oftentimes, hiring managers may have biases they aren’t even aware of that are getting in the way of making the right hiring decision. Our brains form unconscious biases using knowledge about social situations, attitudes, cultures, stereotypes, emotional reactions, and more. If you want to avoid bias in recruitment, you can’t go wrong with making the decision based on cold, hard facts and data. You can entice top candidates to join your team by matching benefits to their individual values, personality, and behaviors. For example, a job candidate with an introverted personality that thrives in quiet environments may appreciate the chance to work from home once a week. Not only will this appeal to the candidate and potentially make the difference in whether or not they accept a position at your company, but it will also help maximize their potential as an employee and improve employee satisfaction. If you work in human resources, chances are that you don’t have a lot of extra time on your hands to organize recruiting and hiring information. Many recruiting tasks that used to require hours of manual labor can now be automated, such as: candidate screening, application tracking, and interview scheduling. Examine and track market trends, hiring finances, workforce demographics, and any other information you need to analyze your organization’s human capital. 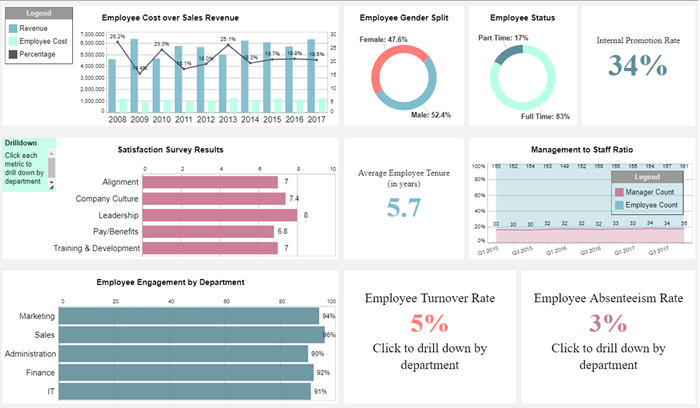 You may want to invest in a dashboard software that can help you quickly and efficiently find trends, correlations, and insights with your data. Some of the modern all-in-one-recruiting software have built-in hiring analytics solutions which will save your money and time while enabling you to make more informed decisions. Include employees in your decision-making process and provide the business reasons behind what you are doing. Turn to a collaborative recruiting and hiring model and include your employees in the process of customizing certain employee benefits to meet individual needs. By tracking your hiring process, you can better manage your candidate pipeline and determine the right platforms for sourcing candidates. The more data you gather, the more insight you will have into whether or not your current talent acquisition strategy is working. You can update and revise your “perfect employee” persona, application process, and job offers over time according to what makes the most sense according to the data. Samantha Marsh is the Marketing Content Coordinator for iDashboards, a data visualization software company on a mission to transform reporting. Outside of work, she enjoys playing golf, listening to podcasts, and watching Michigan football.